• Copie d’Arte – This is amazing. Basically, someone has recreated a bunch of famous artwork… using Lego! As an Art History major who spent hours and hours playing with Lego as a child, I hereby pronounce this the coolest thing ever. • In other related news, Lego is launching a new range of digital cameras and MP3 players. I’m not quite sure how to feel about this! • 5 Ways Blogging Can Make a Difference for You in This Economy from Problogger. Something positive to think about in this glorious Recession Season. • Show Us Your Desktop at Bittbox takes a look at various designers’ desktops. I find it really interesting to see how other creative people organize their things. • Last but not least, XKCD’s I’m An Idiot. This will surely be a classic. Hello, world! I haven’t posted here for a while, but now it’s a new year, and I heard a rumour that new years can involve starting things afresh. Things like blogs. I’m not really into making resolutions, but if I were, I’d definitely resolve to update my blog as often as humanly possible. Speaking of the new year, I rang in 2009 at C’est What, a restaurant/bar/all around cool place in downtown Toronto. Pool, poutine, and awesome people were involved, so it was a really good time. 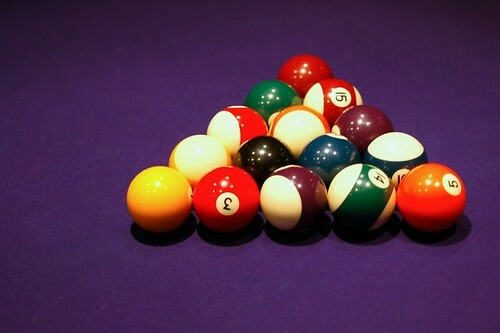 Every time I see a pool table I think of The Music Man. Anyone with me? 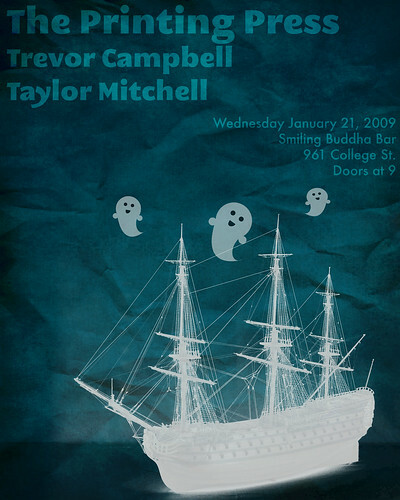 On another note, I’ve already completed my first poster design of 2009, and I’d like to share it with you! For this poster, I used both Adobe Photoshop and Adobe Illustrator. In the past I was more of an exclusively-Photoshop kind of girl, but nowadays I really do like Illustrator a lot. If you couldn’t tell, I created the happy ghosts in Illustrator. I love vector images (which is what you’re creating in Illustrator) because you can blow them up to any size and they retain their smooth edges. This is because the images are actually based on mathematical formulae instead of pixels. It seems that math has come in handy in the real world after all!